I have always loved working with wood, and have built everything from boats and grandfather clocks, to the house my wife and I live in. I began my professional career as a research chemist and specialized in plastics and high performance composite materials. My chemistry background has allowed me to discover just the right combination of ingredients (from the best glues to the perfect finish) involved in the construction of the classical guitar. I have also found my research background directly applicable and have refined my own bracing system for the top, which I believe lends a true world class sound to Johnny Walker Guitars. 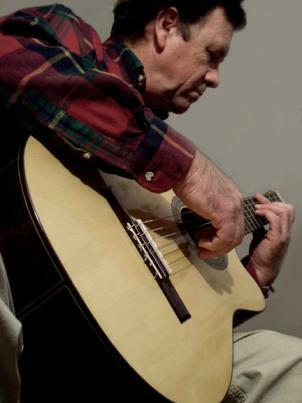 I became interested in guitar building while taking classical guitar lessons from a professional classical guitarist in Tulsa named Clyde Kammerzell. Professor Kammerzell taught out of his home, loved classical music and transcribed his favorite pieces for guitar. He was a tough but fair teacher and I learned a lot about both playing and construction as he also had an interest in building guitars. During this period I wanted a good guitar but couldn't afford one, so I decided to build my own from a mail order kit. Back then it was difficult to access information about guitar building so I went to Ed Moss, a local fiddle maker and sometimes guitar builder. Ed pointed me in the right direction and gave me some good advice about building guitars. I had no power tools, so everything was done by hand and it turned out pretty good as a first attempt. Even Professor Kammerzell liked it. So I was off and running to build an even better one. I have never stopped since, just a few delays to work as a research chemist, start my own composites consulting business, and help my wife raise our two sons. I have continued to experiment with guitar construction, finishes, woods, glues and the effect on tone for years (even getting advice from my older son about how to get more sound projection, since he was taking an architectural acoustics class at the time). I have worked to continually improve the tonal qualities of my guitars and found it was very difficult to get the correct combination of variables to achieve the sound and projection that I was after. It is hard to describe, but you know it's working synergistically when you hear it. I have learned what is expected from a concert quality guitar (having owned a Ramirez for many years). I incorporate all my expertise into every guitar that I build, starting with the wood selected and materials used, the construction methods, and the finishing, through to the completed product. I have gone about as far as I can to improve the quality and tonal characteristics of my guitars and believe they are truly world class instruments. Once you play, and see the craftsmanship of a Johnny Walker guitar, I promise, you will not be disappointed.